Possibly one of our most scenic galleries. Set in a rustic cabin much like those featured in Thom's works, this quaint gallery is a pleasure to behold, let alone shop in. 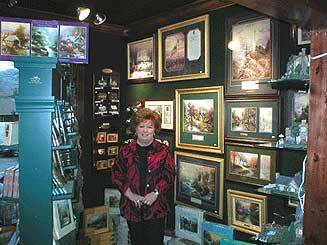 Come visit our gallery and its impressive selection of Thomas Kinkade Collectibles. From Atlanta, GA: Go through Cherokee, NC, take 441 North through the mountains to downtown Gatlinburg, turn right at traffic light #6. We are located on the left, across the bridge. There is parking in front of the gallery. From Interstate 40 West: Take Dollywood/Pigeon Forge exit - turn right (Route #66), turns into # 441, stay on this through Sevierville, Pigeon Forge, and into downtown Gatlinburg. 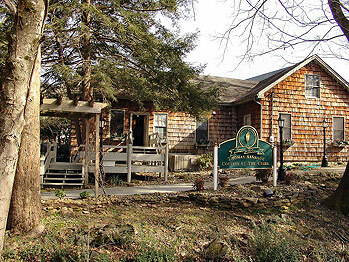 Turn Left at traffic light #6, Cottage is located on left across bridge, there is parking in front of the cottage. From Asheville: Right onto Foothills Parkway, left onto , right onto #321, downtown Gatlinburg, turn left at traffic light #3, next left at traffic light #6. Cottage is located on left across the bridge, there is parking in front of the cottage.